The National Chairman of All Progressives Congress (APC), Chief John Odigie-Oyegun, has called on the Acting President, Professor Yemi Osinbajo, to direct security agencies to arrest perpetrators of hate speeches, images and songs. He also said those arrested must be swiftly brought to justice. Oyegun made the call yesterday, in his reaction to an audio recording currently being circulated, especially in the northern part of the country, which he described as “dangerous and despicable”. “We cannot sit idle and watch a few disgruntled individuals destroy our democracy, and God forbid, the nation that we all fought hard to achieve and build,” he said. “The merchants of hate don’t know or just don’t care about the consequences of the fire they are smoking in the country. But they have the experiences of other countries to learn from. Rwanda remains a classic example on our continent. However, even as terrible as Rwanda was, it would be nothing compared to what could happen if a huge country like Nigeria is allowed to fall into the disaster of hate-driven conflict. “This is why we must all rise, regardless of our political differences and condemn these ugly and shameful acts with one voice,” he said. 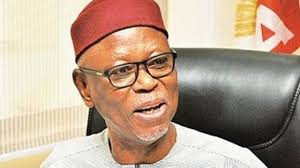 Odigie-Oyegun, who noted that ethnic distrust was not new in Nigeria, attributed the rising wave of hate speech, negative religious and ethnic utterances and actions currently being experienced to part of the fallout of the 2015 presidential election. “Anyone participating in an election knows that there could only be two outcomes - you win or you lose. When you lose, you prepare for the next election. What we have seen, however, is that since 2015, some politicians and political groups have carried on as if they wish the country itself collapses just because they are no longer in power. This is tragic indeed,” he said.